In today’s article, we are going to share Mirror Trader review which is one of the recently launched trading system. 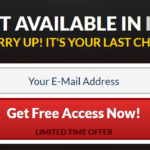 The concept of this binary options is really apealing, but friends it is a SCAM. We recommend you to read this review before taking any step or making any investment in Mirror Trader Software. The entirely new trading scam is promoted by shady email spammers and is full of lies. John Harrison is the name of unknown person who called himself CEO of this FAKE software. We have checked about Mirror Trader on the internet and found lots negative reviews about it from the users. On the basis of these review we decided to do a deep research about Mirror trader and observed that it is SCAM. Even we manage to gather some proofs which are sufficient to declare Mirror Trader a SCAM. In upcoming paragraphs, you will read about everything you need to know about Mirror Trader which includes What is Mirror Trader System? Who Created it? And why we are calling Mirror Trader a SCAM? So without further delay why don’t you start reading Mirror Trader review. What is Mirror Trader Software? 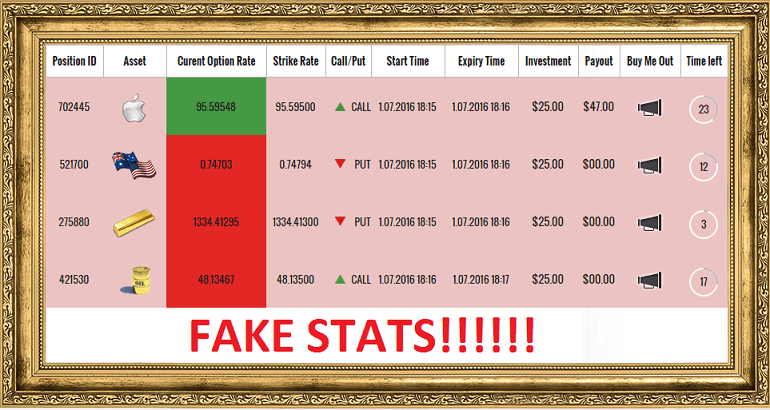 Mirror Trader is a recently launched Binary Options Auto trader created by unknown John Harrison who also call himself CEO of this bogus software. 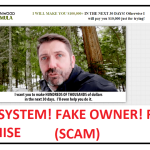 John Harrison in the pitch video shared that using this software you can earn you $14589 in just one day. He also mentioned that, from last three months lots of users has been using the Mirror trader app and all of them are adding an average income of $14500 into their bank account. Indirectly John Harrison wants to say that all these users who are using Mirror Trader are millionaires and you can also become one out of them. He also claims that Mirror Trader is 100% risk-free. According to John Harrison, the software is very easy to use and users who don’t have much knowledge about trading can use this trading software to earn a profit. He also mentioned that lots of users have already earned lots of money in last three months and now they want 50 more users. The 29 users has already joined Mirror trader and now they are looking for remainaing 21. Mirror Trader Review Points – Why It is a Scam? We already know that John Harrison is a FAKE CEO and the reason why we calling him FAKE is because of PUSH Money App. If you’re checking reviews on our site regularly, then you definitely know that few days back we have exposed a fake trading app called PUSH MONEY APP. In the pitch video of that application, this fake John Harrison was showing people how quickly they helping users in earning money. We have already proved Push Money App as a SCAM trading software, then how we can believe Mirror Trader a genuine trading software? We also tried to find about him on the internet and found nothing which clearly confirm that Mirror Trader is a SCAM. In the pitch video, John Harrison mentioned that from last three months lots of users averagly earning $14000 a day. But when we checked the whois details of Mirror Trader official website. We found that the website was registered on 26 June 2016, only a week ago. If the official website was available for users 6-7 days ago, then from where these these users were earning $14000 from last three months. Also how they got their 29 members who already started using a Mirror Trader. 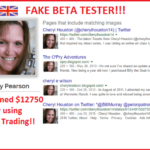 Now this also confirms that Mirror Trader is a FAKE Trading software. John Harrison shared that the reason why Mirror Trader can help you in earning $14000 in a day is the super-fast data servers between his system and markets that find out quickly whether you will Win or Lose the trade. Now the reason which he is giving is not genuine because there is no role of these technologies in the binary option. We all know that earning this much profit using Binary options in just one day is impossible. We have already reviwed lots of trading softwares or application in our previous article and none of them assure you this much amount. So on the basis of our past experience, we can give you gurantee that they using this statement just to get the attention of the users. So that more and more users create an account on Mirror Trader. We have check the whole internet and found only one place who is endorsing Mirror Trader is its official website. The popular trading sites and forums are full of negative reviews for Mirror Traders. If you scroll down on the website, you will found out users who already earned great amount using Mirror Trader. In the list you will found Alice Smith and Timeo Cote. 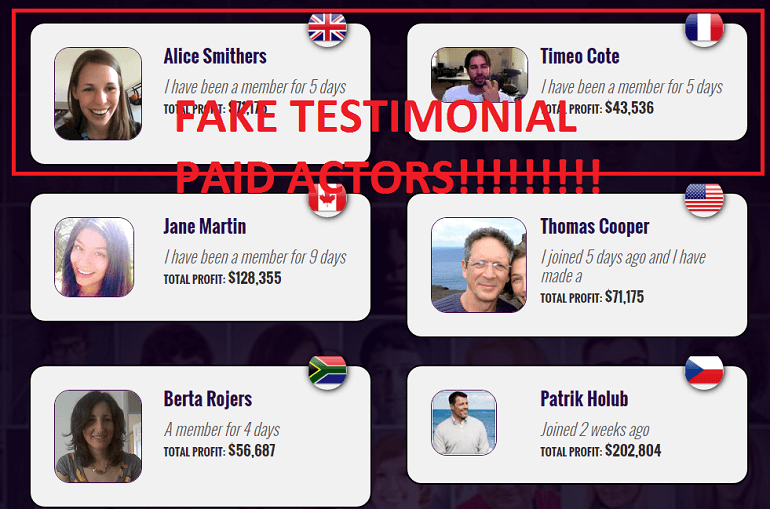 We know both of them very well because both of them are paid actors and already provided their fake testimonials for other SCAM software like Cloud Trader, 98Success, and Profit Maker. On the website, you will see a counter that showing you the live status of trades. Unfortunately, it is completely fabricated and added to the site just to gain the faith of the users visit the site. 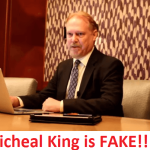 Mirror Trader has Fake CEO, Fake testimonial provider, even some popular websites are calling it SCAM too, then there is no point in beleiving it. We have also provided you sufficient proofs that are enough to call it a SCAM. So we recommend all our readers to stay away from. In case you think that our review is not genuine, then you’re free to invest in Mirror Trader, but we are sure that you will defintely lose your money. What your think about Mirror Trader System let us know in the comments. 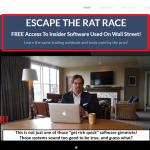 ICE 9 Technology Review – Another Scam | Stay Away !